Charlotte Bronte, I still love your writing style. I love your descriptions and how you can convey an emotion so perfectly. I want a t-shirt that says, "Happiness is not a potato..." because that cracks me up. However, Lucy Snowe might be too enigmatic for me. In Villette, Lucy Snowe, a person we know little about, for some unknown reason is all alone in the world. She needs to make a living. When she hears that Labassecour, a French country, pays English ladies well as teachers, she hops on a ship and heads there, even though she doesn't speak the language. On the ship, she meets a spoiled girl named Ginevra who tells her about the school she will be attending in Villette. Sounds as good a place as any, so Lucy gets herself a position as nanny to the children of the proprietress, Madame Beck. Madame Beck could work for the CIA, she's such an expert at snooping, but she likes what she sees and convinces Lucy to try teaching. Lucy is very lonely but through a series of unbelievable coincidences discovers a bunch of old friends living right there in Villette. What a small world! Lucy then becomes entwined in their domestic dramas while working toward her own goals. I don't know what to make of Lucy. As narrator, she keeps large pieces of information to herself. At least in Jane Eyre, we knew why she was living with her aunt. Lucy might have dropped to earth from a spaceship, how would we ever know? Then, as Lucy makes her way in the world, she leaves out other bits of information. The discovery of Graham comes as a surprise to the reader, even though she knew his identity for many chapters. She's so secretive, not just to the reader but to others in the story as well. What is her deal? Her interactions with other characters are frustrating as well. She doesn't participate in those relationships so much as observes them. They leave her alone at Madame Beck's for months, then out of the blue say, "Oh Lucy, come on over." This bothers her. Why not say something about it? She just goes along with it. The only relationship where she shows any of the emotion she keeps bottled up inside is the one she has with Ginevra. I found the barbs they threw at each other some of the most amusing and witty exchanges in the book. Ginevra is the perfect foil for Lucy. She's everything Lucy is not. Lucy could learn from her. The 'romance' part of the book felt forced, as if it was expected to be there so it must. The guy was a jerk to her most of the time. If she stood up to him the way she did Ginevra instead of using passive aggressive tricks to get under his skin, I could have enjoyed it more. That's not to say that there weren't parts of the book that I loved. Villette was ahead of its time, even more so than Jane Eyre, in terms of feminism. Lucy is not in search of a man to marry and take care of her. She likes to work and when an opportunity of a better paying position presents itself, she turns it down because it interferes with her future plans of being completely free. Lucy is her own person. The introduction of my book mentions that one of Villette's strengths is Lucy's 'unknowableness.' If it is, then it certainly works. I know very little about Lucy after 450 pages. That might be what makes the book great, actually, I keep thinking of it and wondering how I truly feel about Lucy and Villette. So do I recommend it? Any lover of the Brontes should read it. It does drag in places and I slogged through parts at the end but I think it was worth it. It is mired in French and unless you have footnotes, or are bilingual, you should have a French-English dictionary handy. My 'Comment ca va?' high school French didn't cut it. 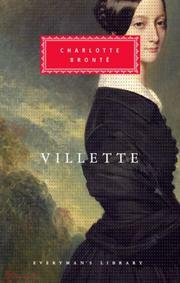 Have you read Villette? What were your impressions? I haven't read this, but it has been on my list, for a while. I think I may need a copy that has extensive notes.. I am reading the Professor right now and that has a lot of French in it as well.. I'm quite curious about this one (especially the progressive aspects), but I'll keep in mind tat it's very different from Jane Eyre. I've long wanted to read this book, but now I'm kind of hesitant if you really don't get to know the main character much. Amy- I might need a second reading but not for awhile yet. Suey- I could pick out a word of two in the French parts but not enough to make sense. Luckily, there were footnotes. Charlie- It is a much slower read. I hope you like it. Iris- Villette is said to be an improvement over The Professor so I hope you like it. Nymeth- Yes, I think it should come with a sticker, "Not like Jane Eyre." Anna- I hope you give it a try anyway. Some people love it. I read Villete a few months ago-I agree the romance seems forced-I think the sections of the book at the school are among the best of the author's work-I laughed so much at some of the class room scenes especially the one where Lucy put a bully in her place-really there are only seven Bronte Novels so in time Bronte Lovers should read them all-I have 2 to go! I enjoyed reliving the book through your insightful post. I'm looking forward to reading more Brontes. I LOVE JANE EYRE. Sounds like this isn't the best -- and rather annoying in places, but still something to read. I am currently reading Jane Eyre and am in love but have to admit I was bummed when I read some details about the book on the web that I hadn't figured out yet from the book. Er, did that make sense? Cuz that's why I'm waiting to read your review. I'm a wee bit out there today. I honestly could not get t hrough this one. I made it halfway before I gave up. Lucy's vitriolic hatred of everyone around her (the French, Catholics, the Irish...) just did me in. She seemed bitter and awful, and I had no interest in reading more of her thoughts. I loved Jane Eyre, yet is the only book of her's that I have read. I must set out to read more. This one is on my TBR. Lazy Sunday Thoughts: Canada Reads Again! What Would Jane's Characters Do?